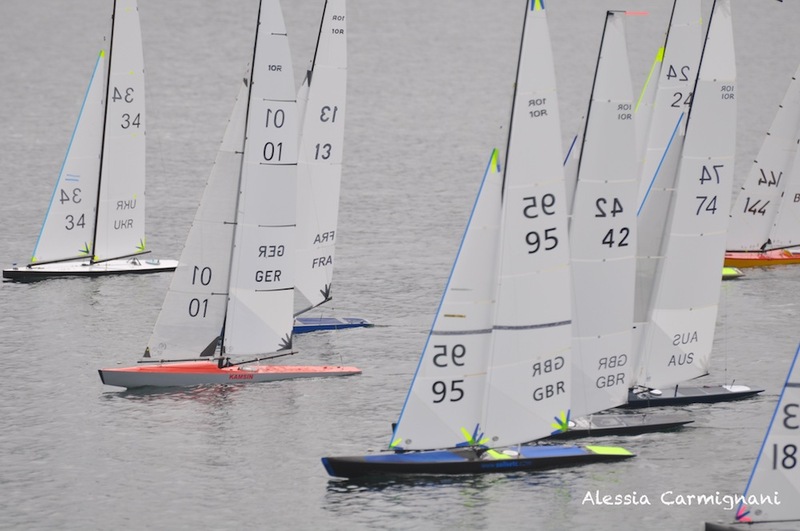 Two years passed from our previous big IRSA event in lake Garda in Italy, and the next Tenrater World Championship was held in a beautiful venue of Biblis sailing club in Germany. With the same team and almost the same boats, we tried to improve our results in a different weather conditions with light winds and no waves. After 2 days of traveling by car, on 22.05 in the late evening we came to our accommodation and in the morning of 23.05 went to the venue in Biblis. All the day of 23.05 passed in measurements and trainings. First day we waited half a day for the wind, and finally got it. After qualification race me and Andrey Kadantsev went to A fleet, Andrey Koval had an issue with rudder servo and fell to C fleet. Then we stayed all in same fleet after race 2. I race 3 I went main part of the race at 3 position, Andrey Kadantsev was somewhere near, but then we both had a weed. I was lucky to stay in A fleet, Andrey fell down. Second day. Some races were moved to lake B. It was not so convenient as lake A to sail there due to long way to travel onshore. Also I had an unfair protest against me and after it fell in fleet B, and passed race 6 in B fleet. Andrey Kadantsev fell in C fleet and stayed there. Andrey Koval promoted one time to B fleet, and then fell down back again. At the end of the day I finally managed to promote and stay in fleet A. Third day. We had 2 more races. 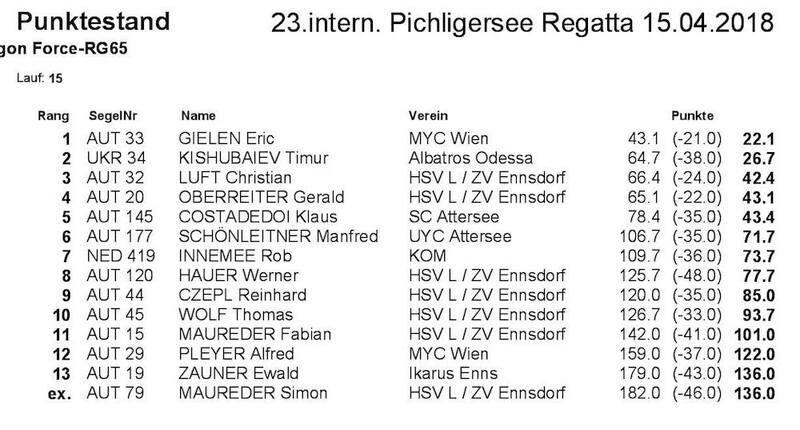 I fell in B fleet in race 8 and in last race had a redress of an average result. Finally my 17th position was a good result in such a strong fleet. Andrey Kadantsev took 32th place and Andrey Koval 45th place. Meanwhile, the fight on top was very tight till the final day. Brad Gibson (GBR 42) was the more stable and was unreachable before the final race. World Campion 2016 defended his title very well in 2018. Christophe Boisnault (FRA 13) won final race and become 2nd improving from his 3rd position in 2016. Matteo Longhi (ITA 24) became 3rd and Graham Bantock (GBR 95) - 4th with a very little points difference from 2nd and 3rd. This was a very well organized and memorable event. It was pleasant to communicate with so many good talented people from all over the world inspired by radiosailing. 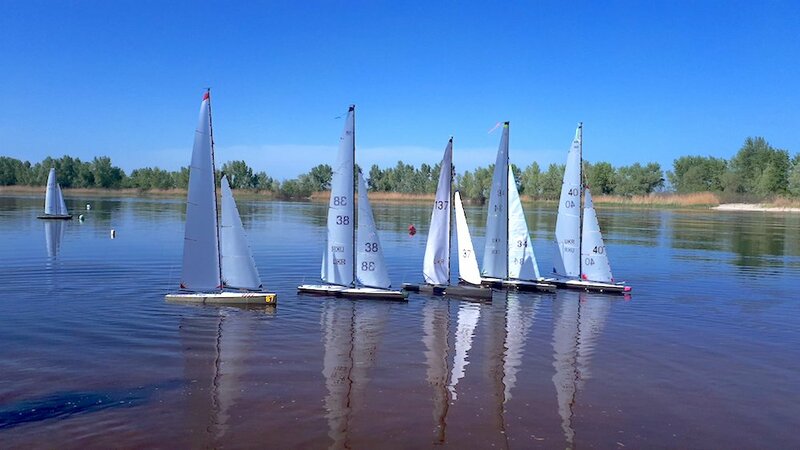 04-06.05.2018 Kremenchug Sea Cup 2018 competitions, as a first stage of Ukraine Cup 2018 were held in Cherkassy, Ukraine at the Water sports station. Second day there were F5-E class races. Also very light wind all the day. 21 competitors (14 seniors and 7 juniors) competed in 2 heats by HMS system with 5 promoting. Third day there were F5-P class races. Finally, we got the wind of 2-4 m/s. 22 competitors (13 seniors and 9 juniors) competed in 2 heats by HMS system. The racing was very tight. 4 boats pretended to win. 5 full races were held with one discard. At the end, the difference between 1st and 3rd was only 0.4 points. 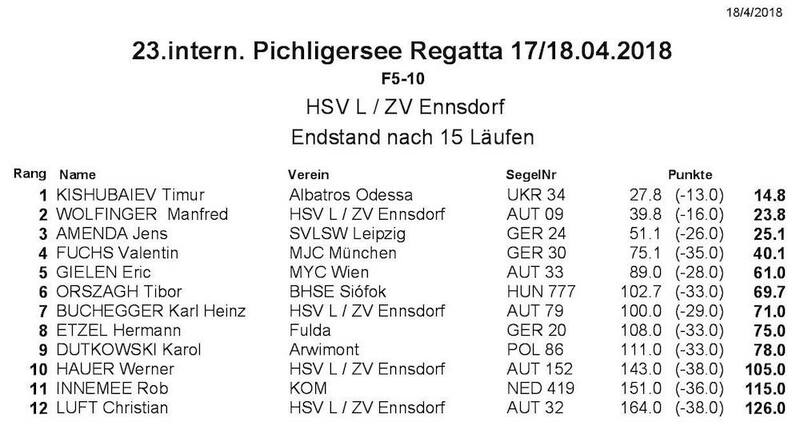 Traditionally in April, Manfred Wolfinger and his brave team of HSV Linz/ ZV Ennsdorf are a welcoming host of Pichlingersee regatta, the most attended in Eastern Europe. 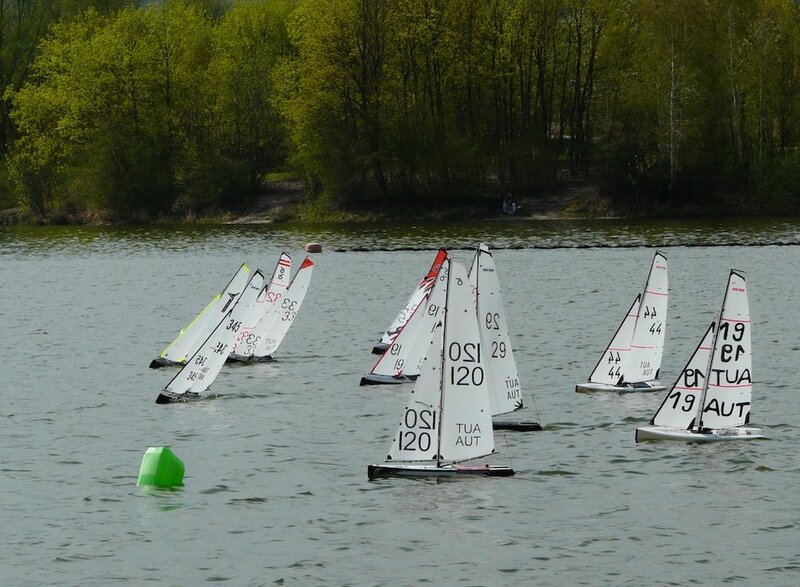 This time regatta started on 15th of April by DragonForce 65 class racing day. 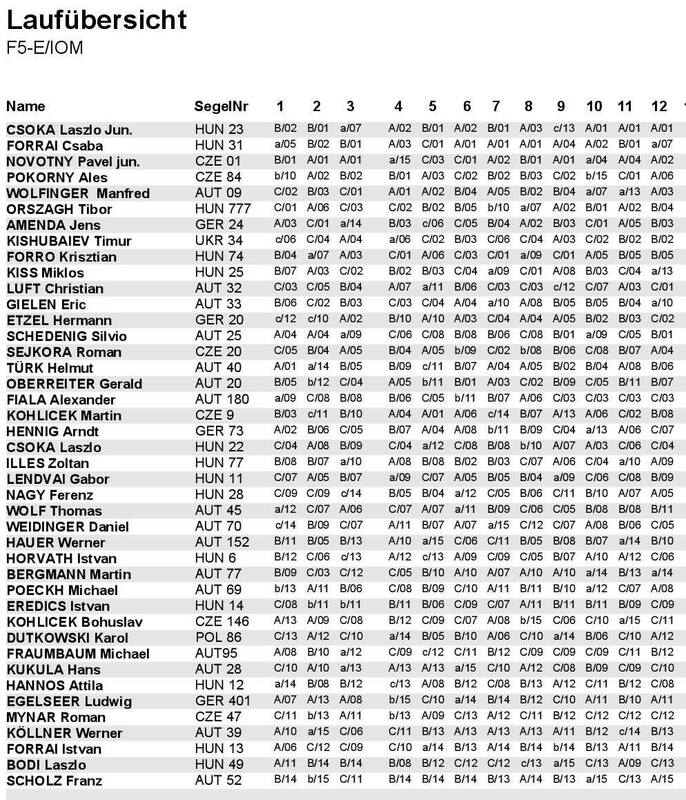 It was also the first National Austrian Championship in this class, so the number of participants was higher than year before. 14 competitors from Austria, Ukraine and Netherlands took part. 12 seniors and 2 juniors. Second day was racing in Mini40 multihull class. 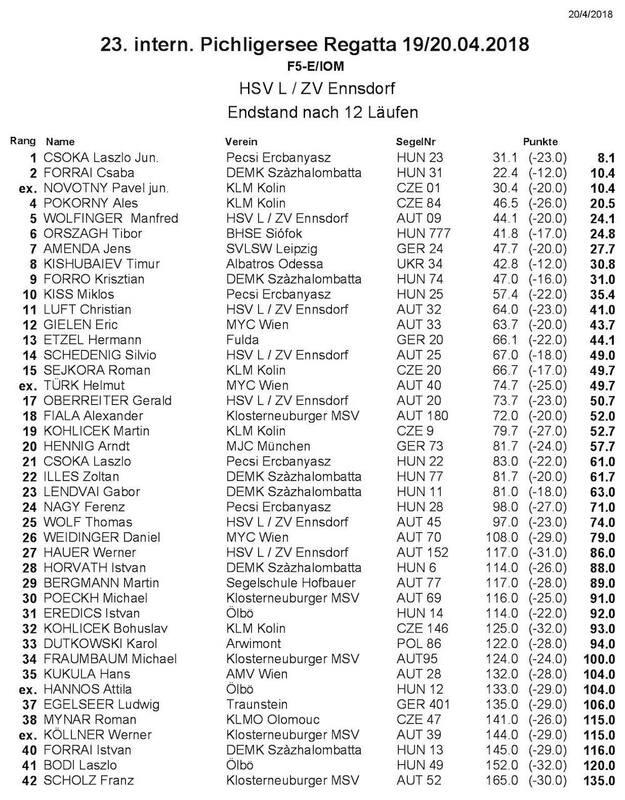 Unfortunately, only 2 competitors took part and Eric Gielen (AUT 33) made another gold in a battle against Hauer Werner (AUT 152). I was stable at the top of the fleet with 6 wins and 9 points gap to the second position Manfred Wolfinger. 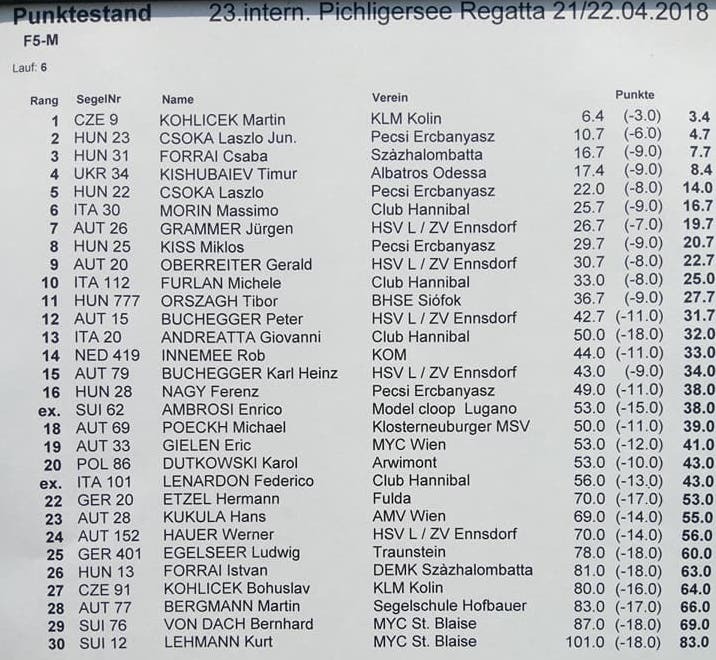 19-20.04.18 were the most popular days at Pichingersee regatta as F5-E/IOM class races were held. 42 competitors from Austria, Czech Republic, Germany, Hungary, Poland and Ukraine were divided onto 3 heats managed by MSS system. 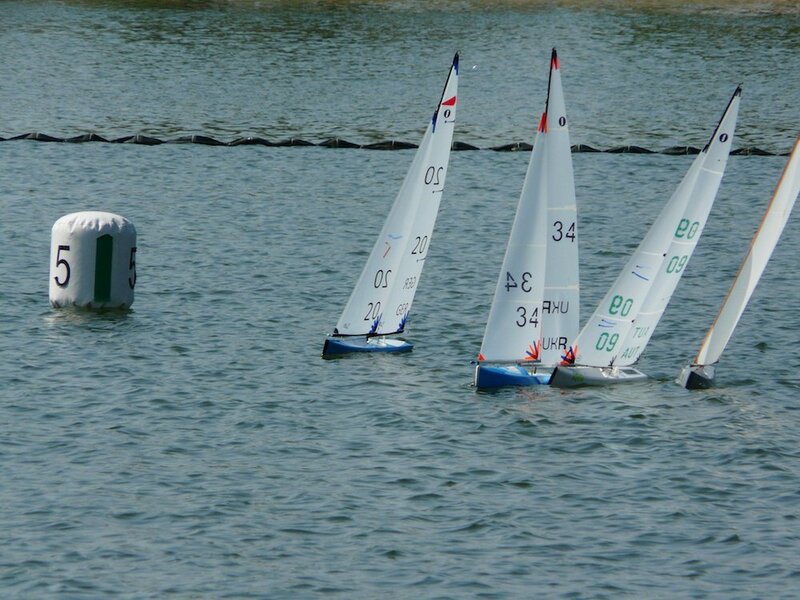 Last days of regatta - 21-22.04.18 - races in Marblehead class were held. The most attended stage of Europa Cup series was visited by 31 competitors from Austria, Czech Republic, Germany, Hungary, Italy, Netherlands, Poland, Switzerland and Ukraine. They competed in 2 heats by MSS system. Thanks for organizers and all competitors for a wonderful fest of radiosailing!